You must deactivate the devices in addition to the front passenger seat belt before fitting a child seat in the front passenger seat. 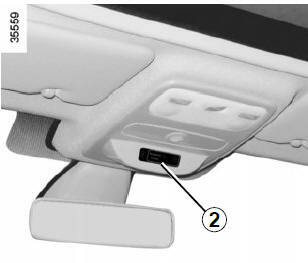 To deactivate the airbags: with the vehicle stopped and the ignition off, push and turn lock 1 to the OFF position. display 2 is lit up and, depending on the vehicle, that the message “airbag passenger deactivated” is displayed. This light remains permanently lit to let you know that you can fit a child seat. DANGER Since front passenger airbag triggering and the position of a rear-facing child seat are incompatible, NEVER use a restraining device for rearfacing children on a seat with an ACTIVATED AIRBAG in front of it. This provides a risk of DEATH or SERIOUS INJURY to the CHILD. 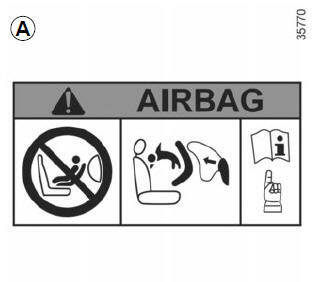 The passenger air bag must only be deactivated or activated with the ignition off. 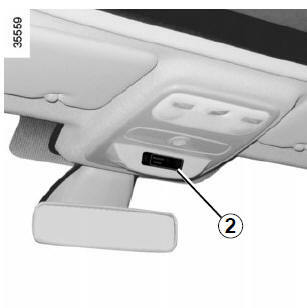 Switch the ignition off then on again to reset the air bag in accordance with the lock. 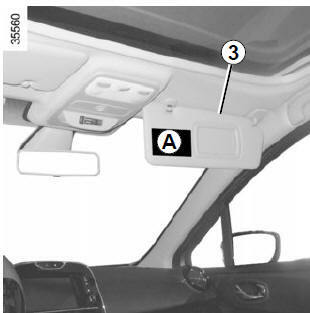 The markings on the dashboard and labels A on each side of passenger sun blind 3 (example: label shown above) remind you of these instructions. You should reactivate the airbags as soon as you remove the child seat from the front passenger seat to ensure the protection of the front passenger in the event of an impact. 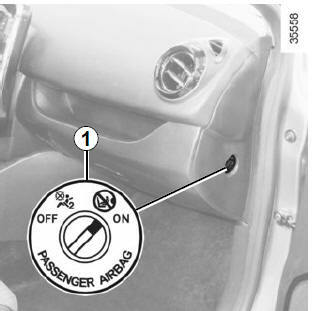 To reactivate the airbags: with the vehicle stopped and the ignition off, push and turn lock 1 to the ON position. comes on the display 2 after each startup for around 60 seconds. The front passenger seat belt additional restraint systems are activated. It is forbidden to fit a rear-facing child seat to the front passenger seat if the airbags activation/deactivation system is faulty. Allowing any other passenger to sit in that seat is not recommended. 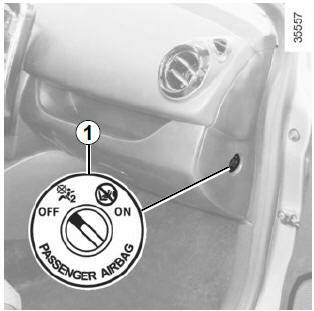 The passenger airbag must only be deactivated or activated when the vehicle is stationary.